Gut bacteria will determine your health. Thank you to Creative Commons. Raising your mood might be as far as bacteria in your refrigerator. I mean friendly bacteria from fermented foods. This is this friendly bacteria, effects levels of serotonin in your body. Serotonin, which influences mood, sleep, depression and aggression, is more concentrated in the gut than the brain. Something like 5-10% is stored in the brain and the remaining 90-95% is in your intestines. This might explain the problems of using certain drugs to raise serotonin in your brain and not your intestines. The brain and intestines produce serotonin separately from each other. So, the level of serotonin in the intestines will affect the brain. Many drugs, such as SSI Serotonin Uptake Inhibitors, work by aiding the body to keep most of its mood-calming serotonin in the brain. Fact is, 90% of your body’s serotonin is in the gut. The gut then sends a signal to the brain that all is good. The Department of Nutritional Sciences at the University of Toronto conducted a study of 39 people with Chronic Fatigue Syndrome. One group of subjects were randomly given significant amounts (24 billion Colony Forming Units:CFUs) of a yogurt-type of bacteria (lactobacillus casei strain Shirota (LcS)). The second group received placebos. Within two months, the probiotic group demonstrated a marked decrease in anxiety, dizziness, appetite changes and shortness of breath as well as an improvement in their sleep patterns. A similar study involving mice was reported in the December 2011 Journal of Neurogastroenterology and Motility. 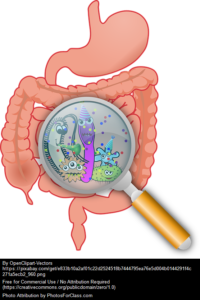 In this experiment the probiotic Bifidobacterium longum, was found to reduce anxiety behavior in mice with colitis. Better bacteria meant happier mice. To get the maximum benefit, of probiotics, you can also reduce all white sugar. This means even artificial sweeteners. A 2008 study at Duke University found that rats fed Splenda had a significant reduction of good bacteria in their in their digestive tract.